Brittany Canner returns home to Greenland, New Hampshire after 8 days in hurricane-torn Puerto Rico. Heartbreak and isolation is how one New England native describes life on Puerto Rico in the days following hurricane Maria. After dozens of canceled flights, Brittany Canner of Greenland, New Hampshire, finally caught a plane off the island and flew into Boston on Thursday night. Canner said it was truly a sigh of relief to escape what she describes as apocalyptic conditions on the island she’s called home for the last two and a half years. “I felt like I was in a movie,” Canner said in an interview with NBC Boston on Friday afternoon. Hurricane Maria hit Puerto Rico overnight, and by morning, her tropical paradise was unrecognizable. 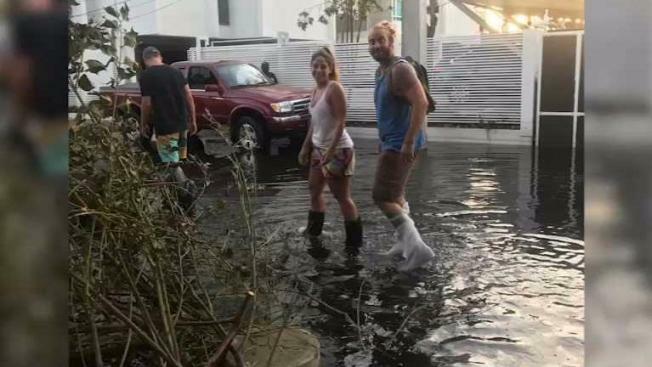 She said debris-filled water flooded the streets, destroyed her favorite restaurants and damaged homes and cars across the island. “I’m not kidding when I say eight to 10 hours is how long you could wait in a gasoline line,” Canner said. But she admits that her disappointment pales in comparison to those who grew up on the island. “I have friends whose homes are ruined, whose lives are completely ruined there,” she said. What’s worse, Canner said, is that Puerto Ricans have been left for days feeling hopeless and alone. “Just that feeling of, ‘Where are the people who are helping us?’” she asked. By the time Canner caught her flight out of a storm-ravaged airport on Thursday night, she was encouraged to see some aid coming in, but still frustrated that it didn’t happen sooner. Canner said she’s still trying to figure out if she’ll go back to Puerto Rico or if this trip home was her last.